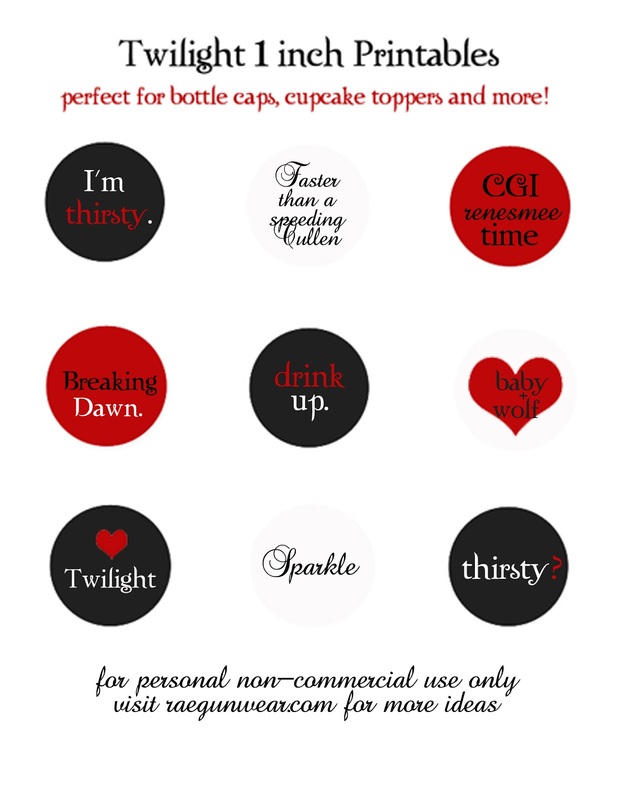 So as you probably know this weekend the last installment of the Twilight movies, Breaking Dawn II, hits the theaters. We’ve got our tickets for Sunday night. I don’t know about you but I’m super excited and super dreading seeing CGI-ified Renesmee all at the same time. I know there are a ton of Twilight haters out there but I’m not afraid to admit that I thought the books were a lot of fun. If you want to know how on earth I can be so into books and still like Twilight I think Shannon Hale (of the Princess Academy fame and more) summed of many of my thought exactly! And while I’m not a crazy fan like I am for ahem Divergent and Potter, it’s an excuse to have a party so I am in. 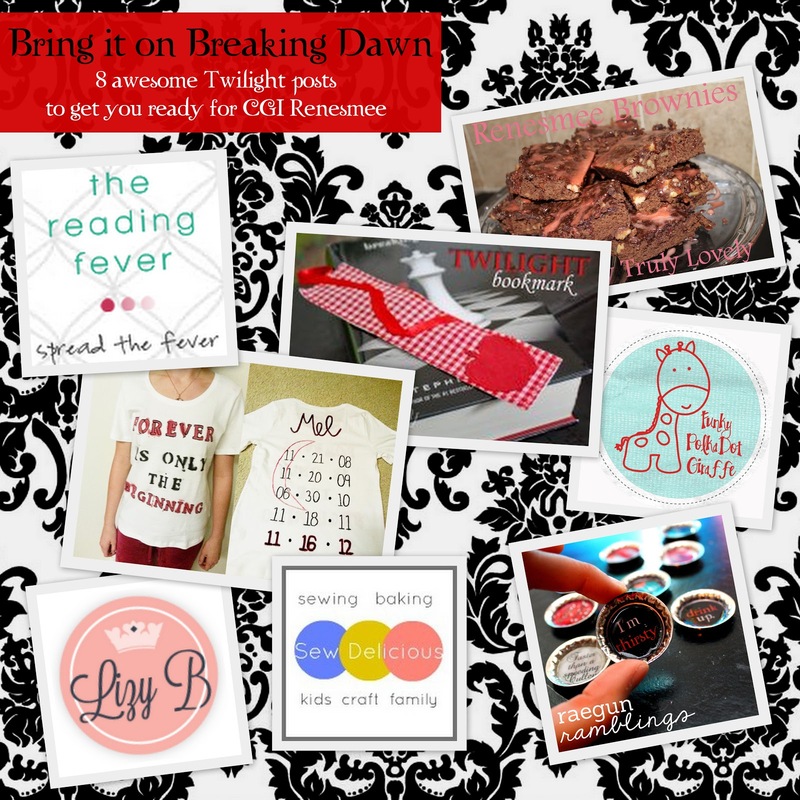 Joining me today are some of my favorite Twilight reading bloggers. We all have come up with fun Breaking Dawn posts for you. I hope you’ll click on each of them and see what every one has come up with. In case you missed my post from last week, check out my 10 books for Twilight fans that they might like even better. Happy Breaking Dawn week! I made this fun Breaking Dawn printable that is conveniently sized so it’s perfect for using with bottle cap crafts or as cupcake toppers! 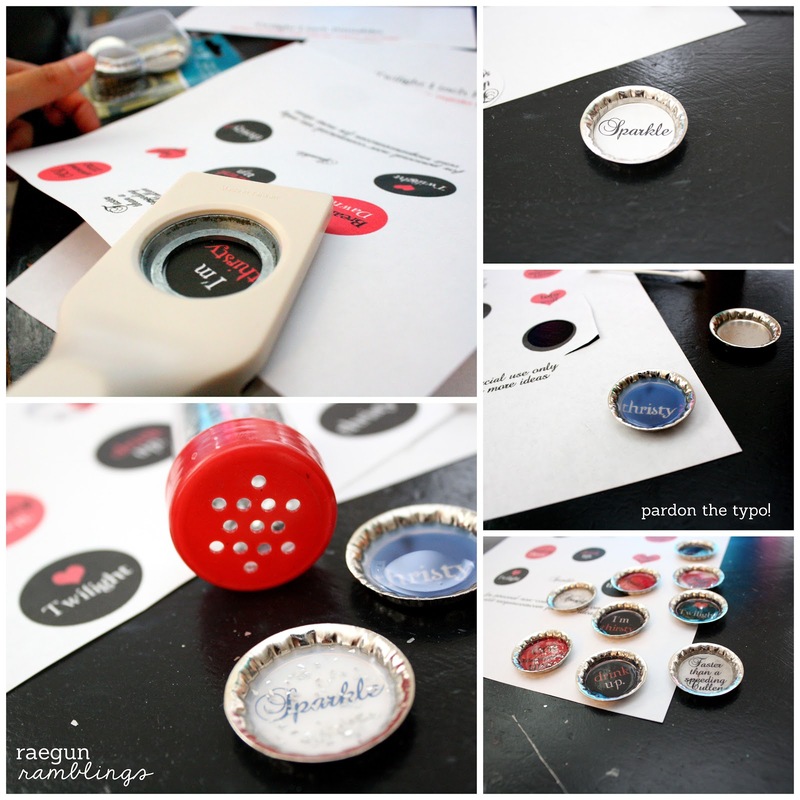 While the lovely Heidi already shared how to make bottle cap pins with resin when we did our Hunger Games Party I wanted to show another way using Mod Podge Dimensional Magic (one of my favorite craft products ever – and no this is not a sponsored post I just love the stuff that much!). First print off your images. Then although I skipped this step I think if you do this you’ll have less bleeding than I experiences. Paint a thin layer of Mod Podge over the images. Let dry. 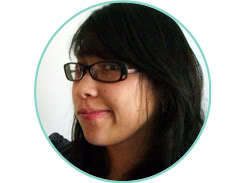 Also I think if you get your image printed on a laser printer that may help to (can anyone confirm that?). Punch the images out with your circle punch. Put a small amount of Mod Podge in your bottle cap. Place and press down your image. Allow to dry. Then cover with Dimensional Magic. If you are using glitter sprinkle it on in. Allow to dry fully (on a flat surface). Once dry put a little glue on the back and attach the pin backs and you’re done! Cute right? I was also thinking it would be fun to attach some ribbon and have them be little ornaments or a necklace bail to make a fun pendant. I’ll be giving these to my fellow movie goers on Sunday. Hahahah this post made my morning!! I’m so glad I’m not the only “Twi-hard” out there. ;) Can’t wait to see what you thought of the movie Marissa! I had the Hunger Games bottle cap pins printed on a laser printer and I didn’t have to cover them with mod podge before using the resin. These look great! Have fun at the movie! Thanks guys. Kara I’m so nervous for the movie haha. And yes Penelope you should definitely give it a go! I’m with you on that… I enjoyed the books, but there are ones I loved more… Regardless they were fun! Love the cute ‘sayings’ you used for the printout. These were very cute and fun! Hi, I found you over on It’s Overflowing. This is such a great idea and one that my girls would LOVE. Your cute little sayings are perfect. And I had no idea you could actually buy bottle caps. Who knew? So glad you shared! They are gorgeous Marisa! I finally went with my sister and saw the film yesterday. The geek in me loved it. If I was a serious film critic I would have hated it, but I went for entertainment pure and simple :) CGI Renesmee has some pretty average moments. The fight scene took me by surprise and I was like “WHAT!?”. Anyway, overall I was happy! Very fun! I need something to do with all my bottle caps. Thanks for linking up at Romance on a dime! !